It will help grow the conversation and our learning if you'll check out other participants' posts and attempt to comment on a minimum of three. and model a reading life for students." At the Nerd Camp keynote on Monday, Donalyn spoke about the idea of reading in the "edges." Readers carve out a few minutes here and there throughout their day, even if they can't set aside a chunk of time. We make time while we wait at the doctor's office, at our sister's soccer game, in the bathroom. In the book, I love how she talks to her students about finding reading these snippets of reading time and avoiding "book emergencies." We need to have these conversations with our kids! If the only time our students read is the time we give them in class, are we really creating wild readers? "Reading a book in one sitting is a rare indulgence..." But how exciting to find those books that cause us to do it!! Just last weekend, I decided I'd read a few chapters of Hound Dog True before I got out of bed for my morning coffee. Two and a half hours later, I crawled out of bed after finishing the book! We know we've got wild readers in our classrooms when they find the books they just can't put down. Being new to 4th grade, I'm consciously aware of the fact that I have a lot of learning to do. The ideas Donalyn shares about reading itineraries, response letters, and status of the class gave me a lot to ponder. Responding to reading and reflecting on reading are two areas I know I want to work on with my 4th grade readers in the upcoming school year. To add to the ideas I gained from Donalyn, I'm also reading a book Donalyn told me about, Janet Angelilli's Writing About Reading. I'm excited to see how it will grow my thinking even further! I love, love, love the last paragraph on page 41. Core beliefs. Grounded in best practices. Reflective practice. Especially now with adding more and more technology into our classrooms, I feel we need to know ourselves as educators and ground ourselves in what we believe in. This was a big conversation at this week's Nerd Camp - one that we need to continue to ponder and discuss. I spotted this Wild Reader on a beach in Maine! Choice is absolutely key. I cannot imagine only being able to read what someone else tells me to read. A couple weeks ago, Leah Whitford tweeted this during a #satchat conversation: "If choice weren't so important to us, we wouldn't have menus in restaurants." Donalyn makes some powerful points on the bottom of page 46 that support the importance of self-selected reading material. Yes, our readers need to have strategies and reasons for picking their books, just like we do. Teaching students about "good fit" books will help in their decision making process, but ultimately, I believe that each reader has to be able to make the choice. Reading aloud to students has so many benefits that we have to make sure this is not something that we push aside in order to "cover more" during our day. Read alouds are such a great way to bring our reading community closer together! I guarantee that my 4th graders from this past year will continue to talk about the day we read Silver Packages by Cynthia Rylant. Even though I read it before I read it to my kids, I got to one point in the story... paused... and the big, nasty, sobbing, can't-catch-your-breath tears started. I tried to pull myself together but ended up handing the book over to a student to finish reading for me. We were a stronger community after that day! Being relatively new to fourth grade, I am still building my list of authors. One that I know for sure is Liesl Shurtliff (author of Rump.) Have you thought about which authors would make your list? Curating a classroom library is a topic that is near and dear to my heart! I spent years curating a library of over 3,000 books for my first graders. Now, I have the exciting job of curating a library for my 4th grade readers! My Nerdy friends have been very generous in donating books to me to help with this process. I'm definitely going back to this section of the book as I continue to seek out new titles. In just one year, our classroom library has over 600 titles. My kids have been really helpful in teaching me about what 4th grade girl and boy readers enjoy! July 30 - 7 p.m. Live Twitter chat with author Donalyn Miller! Thank you for your thoughtful reflection and links to more information. Your thoughts about "edge time," read aloud, and protecting time for independent reading are smart reminders. Thank you for weaving in reflections about #nerdcampMI. I was so disappointed to have to miss this year. You talked about reading this book from you new lens as a 4th grade teacher and I was reading it from my new lens as a reading support teacher. It's interesting how our lens of personal experience can change the way we read something. It really speaks to the variety of comments we get from students, each in a different place in life, during our read-alouds. I read Hound Dog True recently, and loved it as well. I think Linda Urban would be an author I would consider if I taught an older grade as she is beginning to build a collection of titles students would love also including A Crooked Kind of Perfect and The Center of Everything. 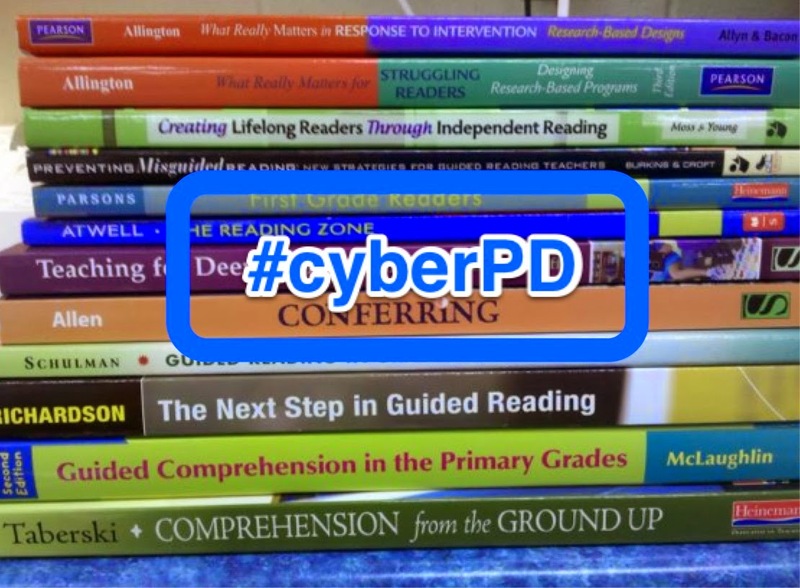 I'm looking forward to co-hosting another year of #cyberPD with you. It's hard to believe this is year four! I'm hoping I can keep up with the growing conversation. Looking forward to stopping by here next week. I was disappointed that you couldn't make it to Nerd Camp, too! I always enjoy extending our conversations face-to-face. With a lot of the professional books I'm reading (and rereading) these days, I find myself picking up different tidbits now that I'm an upper elementary teacher. You're right - it really does impact our personal experience with a book. I think that speaks volumes about the background knowledge (schema) our students bring to the table as well. It's wonderful that we've been able to keep our #cyberPD alive for yet another fabulous year! Thank you for you sharing your thoughts! i agree reading a book in one sitting is a rare instance, but somehow I see this as a "reader' and I am often put off by knowing I can't do this! As I work to rebuild my perception of a reader I plan to include my students and their families. I was so sad to miss nErDcampmi and as I read you post I was happy to hear the connection. I am sure the camp was A-mazing! I am currently collecting pictures of "Wild Readers" to help my students understand wild reading, I hope you don't mind if I screen shot your picture. 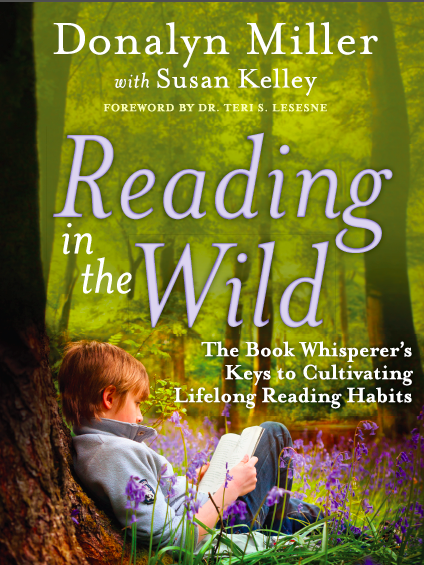 I am looking forward to more conversations about Wild Reading! There is so much to keep close from these chapters, I agree, Laura. I didn't write about read aloud, but it was a large part of my teaching before I became a coach. Now I have the added bonus of sharing ideas with different grade levels, & reading my favorite picture books to classes. Here is one way all of us can model our love of books, and in the classroom, much more of course. Thanks for your thoughts today! Thanks, Linda! We have to make sure we (and our colleagues) preserve the classroom read aloud routines. There is so much to be learned from these shared experiences! A small group of our staff is reading this book this summer and we talked quite a bit about the idea of reading on the edges too. I agree that this is an important idea to talk to kids about early in the year - put that one on my list of beginning of the year mini-lessons. A bit here and a bit there adds up! Also a good staff discussion so teachers can fit in personal reading time once the busy school year begins. I remember my daughter's kindergarten teacher told me years ago that she read every morning while drying her hair! So awesome that your Nerdy Book Club community helped you grow your 4th grade library this year! All the book love in this post shows you and your students had a great 4th grade year! I'm putting the idea of reading in the edges in my beginning of the year mini-lessons, too! How fun would it be to share our best "reading in the edges" moments with our students to help build that community? I think kids would enjoy sharing their favorite times and places, too! I so enjoyed reading your post. You highlighted a lot of the sections that captured my attention and I addressed many of these same ideas on my post as well. I had to smile as I read your comment about reading a book in one sitting. That is one of my favorite things to do. I love it when I discover a book that pulls me into the story so much so that I can't manage to put the book down. We want our students to have similar experiences. I also agree with you about the benefits of reading aloud to our students. Not only are they great for building classroom community but, as you know, they also give first graders access to texts that have more complex ideas and themes. Thanks, Val! Text complexity is definitely one of the many, many benefits to reading aloud to our students. At Nerd Camp, Donalyn also talked about how important it is to read aloud to students at ALL grade levels. Too often, I think we start to abandon this practice in upper elementary... but it's too powerful to leave behind! Hi Laura! I felt like after listening to Donalyn on Monday it made my reflection on what I wrote more meaningful. I can hear her voice now that I've met her :) A thought after reading some of the blogs today is on the edge reading - I've talked to kids about that (my struggling readers) and haven't had much luck. Every year I go around on Back to School Night and introduce myself to each classroom. I feel like the parents know my speech by heart at this point. I think this year after a brief introduction, I'm going to do a quick blurb on edge reading. Convince them to bring books for the kids in the car. Hand off books, not electronics! Thanks for your thoughts today! Isn't it fun to be able to hear her as we read her book?! :) I think you're on to something! Not only do we have to have these "reading in the edges" conversations with our students, but I agree that we have to include parents, too. It will be wonderful to come back to our #cyberPD community in the fall and share how we've all started to incorporate some of these ideas! I'm Jamie from Dublin. I met you at Nerd Camp this week. I was hanging out with you on Monday night and I felt like I knew you from somewhere. I guess I "knew" you because I've read your blog. Anyway it was nice to meet you. I wrote a bit about Nerd Camp, too. Wasn't it amazing? Thanks for your list of first grade authors. I will definitely be using those in my library this year. For your fourth grade list I would suggest Barbara O'Connor, especially for the beginning of the year. How to Steal a Dog was one of my favorite read alouds when I taught third grade. Hope to see you in person or in cyberspace again soon! I'm so happy we were able to meet! Isn't it funny that, because we all connect so much through our blogs and Twitter, it really does feel like we've "known" each other for a while! I haven't read How to Steal a Dog, but I do have it in my classroom library. Thanks for recommending that I read it! Thank you for sharing the point Donalyn made about teaching our kids to read around the edges - it's such an important habit to cultivate in our kids who naturally gravitate towards their electronics instead of towards reading. Thanks for your thoughtful summation, Laura - would have loved to have been at NerdCamp! You shared so many insights that I agreed with that I was just nodding my head up and down. Yep. She's got it. Mmm-hmmm. I get it. I love your focus on responding to reading and reflecting on reading behaviors, habits, and preferences. Those are two important areas for our readers to grow in to become full fledged wild readers! Reading and learning is social, so we need to incorporate authentic reading responses to allow students to grow in the reading community and increase their title and author awareness. I also own that book "Writing about Reading", but it's probably time to dig into a little deeper! Wow - so much to think about Laura! I'm glad you are part of my reading community! Thanks for your thoughtful comments! I agree... our next mission is to get every educator on board. So glad to have you on the #cyberPD team! I'm glad to be a part of #cyberPD this year, and find another fourth grade teacher in the process. Super jealous that you were at #nerdcampMI. I'm starting my own PNW edition next spring. Nervous and excited. I know that reading aloud is often shunted aside, but I could not teach reading and writing without it. I love the community it builds and the discussions it spawns, but most of all I love being able to use read alouds as mentor texts for EVERYTHING. Reading strategies, writing lessons, social skills. A strong read aloud is critical in my classroom. We refer to our current book and previous books multiple times a day, every day. As I moved up to 4th grade this year, I'm almost sad to admit that I struggled with how/when/why to use read alouds in my classroom. Now that I've got a year under my belt, I know without a doubt that read alouds still play a key role in my teaching. I'm excited to have connected with you through #cyberPD and look forward to picking your brain in the upcoming year!! I also teach 4th grade, but have done so for only 2 years. I moved from 8th grade and am, even going into my 3rd year, still getting accustomed to the difference. Luckily, I am blessed with a principal, building, and district that value student-selection and independent reading time. I am asked, almost required, to provide my students with no less than 30 minutes of independent reading time throughout the school day. The students are then expected to read at least 30 minutes at home each night. As a building, we also try to teach students to use edge times. The principal has arranged for a quiet reading room during the lunch periods as well, so that students can go there to read once they have finished their lunches. What I need to work on the most is increasing the time I allot for read-alouds as well as giving my students more control over the selections we read together. Thanks for sharing and hosting this year's #cyberPD! I'm sitting here with my mouth hanging open. 30 minutes of independent reading time almost required in your building. Wow!!! That speaks volumes to the community you have. I'd love to continue to share ideas in the upcoming year! Thank you so much for your thoughts on this! What you made me think about was the author's students should know. The two they all know when they come to my class in 5th grade are Avi and Kate DiCamillo. Not bad! Some of the ones I hope they leave my classroom with are Cynthia Rylant, Ralph Fletcher, Katherine Applegate, Jacqueline Woodson, Seymour Simon, and Lisa Graff. I love your author choices! I'm still getting to know authors for middle grade readers, but by the end of the 14-15 school year, I hope to have at least a working list going for myself.